This Pyrenean stage, the starting point for may pilgrims, is undoubtedly the hardest and most spectacular of all the French way. Demanding ramps and continuing uphill slopes take the walkers from 180 meters in St. Jean Pied-de-Port to an altitude of 1,430 meters to crown the Cize ports. A difficult climb that is later compensated by stunning views and beautiful natural charm that does not go unnoticed by the pilgrims. In fact, St. Jean Pied-de Port is ranked as the second most popular place of departure for Santiago. The main reason for beginning the journey in this enclave is purely the charm of this French town, one of the most beautiful on the Jacobean walk, the majestic climb known as the Napoleon route-where Gallic troops arrived to invade Spain- rejoicing crossing the border on foot. In winter, or adverse weather conditions there are strong recommendations to take an alternative path, one that runs at a lower altitude through the valley of Valcarlos and advances to Roncesvalles, parallel to the national road. Under no circumstances should you disobey the recommendations of the authorities. A number of catering establishments serve to shorten the journey, it is advisable to arrive adequately equip and physically prepared. Aside from all these precautions, the visual reward is unquestionable. The itinerary leaves the pilgrims struggling and exhausted but is well worth the experience. Many pilgrims begin their hike to Santiago in St Jean Pied-de Port (781 kilometres from Santiago), a beautiful French town bathed by the river Nive. An important Jacobean area, due to the fact that it lies just a few kilometres from Ostabat, where three of the main roads pass through the French territory (those that separate Le Puy, Limoges and Tours). In the middle ages many pilgrims gathered in St. Jean Pied-de-Port in order to face the tough climb and subsequent descent to Roncesvalles together. After crossing the gate of Santiago, a world Heritage Site and historic entry place of pilgrims to the enclave, the path leaves by the central and commercial Rue d’Espagne, leaving the old, walled city through the gate that shares the same name. At this point, those opting to reach Roncesvalles via Valcarlos/Luzaide (the route follows an asphalt road and many kilometres of walking at the road side, despite in winter months being the recommended option) should turn right whilst those who have no hesitation in facing the beautiful but demanding ascent should continue left to, immediately afterwards, turn right onto a local road with a slope of one kilometre in length. This steep slope is signposted as the route of Napoleon, the same path followed by Napoleons troops to invade Spain. In these first few meters, where French GR signs (in red and white) alternate with yellow signs, it is recommended that you tackle the tough bumps and slopes calmly. It is important to ration your efforts given that the first 20.5 kilometres are uphill. To replenish energy and an alternative for those who prefer to sleep close to the hill and avoid St Jean Pied-de-Port, at this initial stage there are a number of houses and hamlets that offer beds and provisions, such as local goats cheese. More ascents Following another long slope, which should be taken at a sensible and steady pace, and always on tarmac, you reach the small village of Huntto (19 kilometres from Roncesvalles), where many pilgrims make their first stop. With a fountain, bar and breakfast served from 6.30 am, this rural enclave of Ithurburia, also includes a hostel with room for 32 people and diverse beds. Soon after this stop in the journey and leaving behind for the first time the asphalt road the route heads onto a track. Soon after and having covered flatter terrain, we reach the hospitable enclave and refuge of Orisson (17.45 kilometres from Roncesvalles). From this point, that which specifies no camping allowed, and until Roncesvalles there will be no other areas with services. The landscape unfolds impressive waves of alpine vegetation whilst the road climbs continuously for almost 4 kilometres. We then reach another obligatory stop, the rocky ridge upon which rests the Virgin of Biakorri (13.8 kilometres to Roncesvalles), Protector of the areas shepherds, and the hikers that adorn this area with their varied clothing and souvenirs. On the same road, and through alpine meadows in which the wind prevents you from hearing your own footsteps, leaving on the right hand side the diversion to the track leading to Arnegi (the road that should be taken to join the route that passes through Valcarlos), To continue for a little over two kilometres until reaching the second stage of the days journey on the track. Abandoning the asphalt next to the encouraging milestone that indicates Roncesvaux/Orrega (9.5 kilometres to Roncesvalles). The trail passes immediately the Tribault cross and another stone built refuge to climb for little more than a kilometre until the pass of Bentarte where the Fountain of Roldan is situated (8 Kilometres to Roncesvalles), the last water point in this stage. This fountain is in memory of the Carlomagno general defeated on these lands in the e VIII century. Alongside a track that passes by a beech tree and runs parallel to a wire fence that acted as frontier, to then reach the milestone that indicates the entry route to Navarra. The pilgrim should be on the look out for wooden signs that direct them to the right towards Roncesvalles. Little more than one kilometre to reach the refuge of Izandorre, originally constructed as a safeguard for hikers in difficulty. In the face of any emergency, a communication system connects them to 112. Two kilometres later walkers reach the summit of Lepoeder (4.7 kilometres to Roncesvalles), situated at 1.430 meters, the highest point for the day. 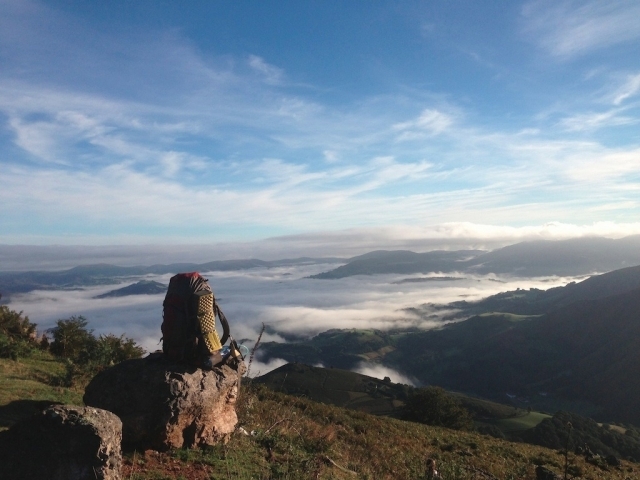 From here, and if fog does not prevent it, the nearby and small Roncesvalles can be seen. The walker is then confronted with two possible options. If they choose to go left, almost half a kilometre shorter, arriving more directly, although with steep slopes until the end of this stage of this journey. Despite being clearly signposted, it is important to take into account that in foggy conditions it is not recommended due to the possibility of getting lost. If you continue to the right, it begins on a paved track on an eagerly awaited descent of 4 kilometres that takes you to Alto de Ibañeta, where legend places the battle of Roncesvalles that made popular the Song of Roland. This epic poem, Chançon de Roland narrates and mythologizes the defeat Carolingian military rear guards that suffered on their return to France following an expedition to Zaragoza. This great first defeat of the Carolingians, in which Roland died, his nephew, touched the French nation. In Ibañeta a monolith was built in memory of the French hero similar to the modern chapel of San Salvador, opened in 1965, the temple recalls the existence of the ancient monastery that since the year 1071 assisted the medieval pilgrims. At this stage there only remains one last effort. The walkers should pass by a Birds of Migration Centre, to, once again among beech trees, descend to the bottom of the valley and continue the course along the river Otezul until reaching the long awaited Roncesvalles. The first building along the path is the pilgrim hostel. This stage, the most difficult without doubt, is only appropriate for expert cyclists. Those who are not experts and opt for the higher route are likely to push the bike up the most demanding climbs. 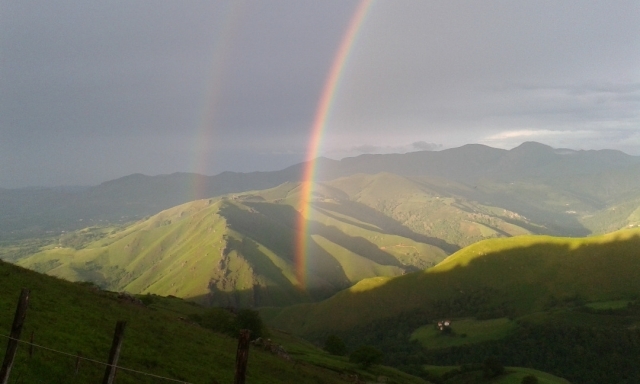 It is therefore recommended, as with hikers that during winter months it is advisable to continue until Roncesvalles via Valcarlos on a route where the majority of the walk is along a paved track, either on main or country roads, although for some kilometres they encounter a track. For this option take the St Jean Pied de Port exit, taking the road to the right that leads to Luzaide/Valcarlos (D933). Having completed the first stage rather quickly, the pilgrims encounter all kinds of services in the beautiful town of Arnegi –noted for its river passage and twin gables- and in Valcarlos itself, where they can, even, spend the evening in a hostel. The towns name (Valle de Carlos) evokes the emperor Carlo Magno who camped here in the valley on his return to France whilst his rear guards were being attacked in Roncesvalles. The parish church is dedicated to Santiago. From Valcarlos, the pilgrims travel along the busy N135 road for over 8 kilometres, in some areas on the pavement for safety reasons. Soon after and now on a track, will face the steepest slopes in this stage of the journey. In Alto de Ibañeta the track joins with the other first optional route.